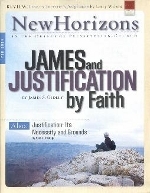 Does James 2:24 require us to modify the Reformation doctrine of justification by faith alone? It reads, "You see that a person is justified by works and not by faith alone." We need a "New Perspective on Paul," or so a number of New Testament scholars have claimed in recent decades. The "New Perspective on Paul" (NPP) has impacted Pauline interpretation at many critical points, creating controversy particularly in its recasting of the doctrine of justification. Jesus says in Luke 16:15, "You are the ones who justify yourselves in the eyes of men, but God knows your hearts. For what is highly exalted among men is detestable in God's sight." Hundreds of bumper stickers proclaim, "God loves you." Some of them add, "And so do I." Love is great and love is grand. Best of all, you can find biblical support for such sentiments. Paul says, "Now abide faith, hope, love, these three; but the greatest of these is love" (1 Cor. 13:13). Peruse the gospel and epistles of John and hear him say, "He who does not love does not know God, for God is love" (1 John 4:8). Yes, "God so loved the world that He gave His only begotten Son, that whoever believes in Him should not perish but have everlasting life" (John 3:16). American Presbyterianism officially began in 1706, when the Presbytery of Philadelphia held its first meeting. But some accounts of the Presbyterian Church in the New World speak of Presbyterian congregations going back into the seventeenth century.